Removable pool graphics feature images of world flags, diver down symbols and other common swimming pool images. 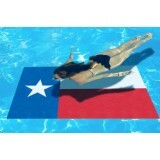 Vinyl pool graphic is removeable and requires no adhesive or complicated installation. Simply drop large pool art into the pool and let it sink to the bottom. 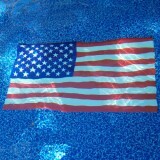 Pool graphics can be flattened with a pool brush or other long pool accessory. Show off your country pride and spirit with a U.S.A. 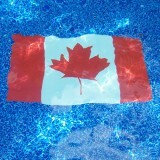 Flag or Canadian Maple Leaf. Made of 1/8" thick vinyl (the same material used in vinyl pool liners) and held in place by the weight of the material and gravity of the water. 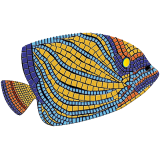 Large pool mosaic images add fun decorations and design to the pool while providing a removable and cost effective feature. Use pool decal mats at pool parties, olympic season, corporate events, swim competitions, indoor or outdoor swimming pools, and other swimming events. Affordable accessory for all types of pools including concrete pools, vinyl pools, above ground pools, inground pools, gunite and fiberglass pools. Won't interfere with automatic pool cleaners and resists pool chemicals and UV rays. Do not place pool decal mats on an incline or rough surface as air bubbles underneath the material will cause pool art to shift. 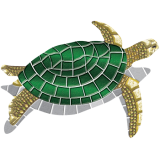 Turtle Mosaic - MED 59" x 44"